Help determine the status of a merchant's order. A shipment from Artisans Craftworks in Mournhold never made it to the merchant, Blivisi Beleth. Talk to Blivisi Beleth on the road between Selfora and the Shrine of Saint Veloth. Travel to Gendyn Beleth in Mournhold. This quest is only offered if you have not yet started The Seal of Three. 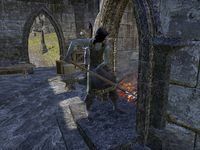 Finishes quest Blivisi's brother Gendyn runs the forge at Artisans Craftworks. She asked me to deliver a letter to Gendyn Beleth in Mournhold to determine the status of her order. This page was last modified on 7 March 2019, at 15:24.